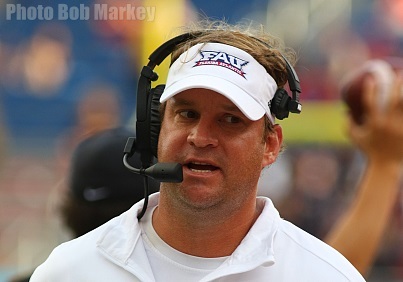 Florida Atlantic Head Coach Lane Kiffin met with the media on Monday to recap the Owls' win against Western Kentucky, the mood at halftime, Devin Singletary, and were he sees the team right now. So recapping the game, I obviously feel very good about how we played in the fourth quarter, 22-0, 250 yards of offense, and I don’t think we allowed a third-down conversion, so really the story of two games. I don’t think after watching it again that we played really well the first three quarters. Special teams made a couple of big plays, blocked field goal and then a fake punt, (that) was kind of the dagger I think because anytime you stop somebody on offense, you know get them stopped, come to the sideline and then all of a sudden, shoot, you have to go right back out on defense, so I thought that was a big play. We’re going to have to play better versus these guys (Marshall). I think this is the best team. I know last week you know they didn't play very well and if you lose the turnover margin three to nothing, you are not going to win a lot of games. Prior to that, these guys were giving up five and a half points a game in the conference and only lost one game. That was NC State and they were ahead of them 22-10 in the second quarter. So these guys are a really good team (on) offense, defense, and special teams and seem to be the best team that we (have) played. You guys have had so many blowouts this year that going into halftime down can be different, what was the mood like? It was good. Obviously blowouts are fun but I think … we either win or you lose and that is all that matters. The fact that we had to go through a game like that, on the road in conditions we’re not used to, momentum at halftime going the other way, and then the third quarter definitely going the other way, down by eight, they have the ball. To see our guys respond like that and play like that, I think was really, really big for our program because you're going to have games like that. They are not all going to go like the first three did, the first three conference games. On Singletary, have you ever seen a guy be that dominating? I coached two Heisman winners in that position. Derrick Henry carried the ball 90 times in a seven-day span. Reggie Bush was pretty dominating. So for this level, I would assume he's that version that, first guy not being able to tackle him. For a guy that size, surprisingly he had his carries go up there, I think it's his career high, and so you worry about that obviously, playing so many snaps, to have to carry so much and he was he was stronger in the fourth quarter. That's how Derrick was. Those Auburn and Florida games where he carried the ball 44 and 46 in a seven-day span, you thought he would wear down, he was actually tougher and so in that way (he’s) similar and making the first guy miss (he’s) similar to Reggie (Bush). They did a good job early with him. We weren't able to loosen them up at all because really outside of the one play, we really didn't do anything in the passing game. That's how we say it to our guys, you know if we don't start hitting these passes, we are going to get played like that all the time and then it's hard. Luckily he made some guys miss, went through some arm tackles, and so you don’t have all of them blocked because there's too many of them, so we have got to improve our passing game. With Driskel, what do you think the struggles were? Do you think it was the quarterback playing in cold weather or what do you think it was? I don’t really believe in an excuse like that because their guy was on fire. Same weather, so we just didn't really perform really well outside and then missed some throws too. What’s the balance right now of letting the kids enjoy kind of how far you guys have come, in the short amount of time versus there's still a whole lot that this team can still do and keeping the focus on things you have to get better at every week? We are continually trying to remind them just like winning and losing is the one that matters at the game, at the end of season all that matters is what is your record. Everyone thinks well you played this team tough, oh this team got blown out, at the end of the day that doesn't matter. You either win or lose, the same thing with your final record so we could be 0-4 in the conference and win the next four and have the same record as if we lose the next four. So it won't mean anything but we won the first four, so we got to keep getting better. We didn't cover very well in man to man and we didn't throw the ball at all very well so we've got to improve those things, because that’s what is going to happen and when you put that on tape that’s what's going to keep happening. Generally are you kind of ahead where you thought you might be at this point? I don’t really think a lot about what your record is going to be. When we got here, everybody said okay what's your goal in the first year because there is just too many variables: injuries, referee’s call … I say it all the time, you watch the last play of the game come down to a field goal and the guy makes it, you know that coach is awesome and the other team is horrible and their coach doesn’t know how to coach. But if it misses, it goes exactly the opposite (just like) a referee’s call at the end of the game. It's more about how are you doing overall, from that picture yeah, I probably say I would take 4-0 in the conference … and all four games over 14-point wins, so that part's good. I don't like how we started, still drives me nuts that didn’t finish the Buffalo game regardless of the injuries that we had. It is what it is, you can’t change that and maybe that was a learning lesson. If we would have got by on that, maybe we wouldn’t have had the same anger towards playing again. With the short week this week, what was practice like today? Today was Tuesday so their clocks are back, so we had to go fast to get through everything. You are a whole day short as coaches and so not a lot of rest there but that's fine. I just feel it’s important to get them back on the schedule. So today was Tuesday, and we put pads on in practice (like) on our Tuesday schedule. We really missed the Monday, but at least we are on schedule. Hi didn't see a thread for 2018 recruiting also notice we are ranked pretty much at the bottom of recruiting at 247 etc. nobody worried about this?